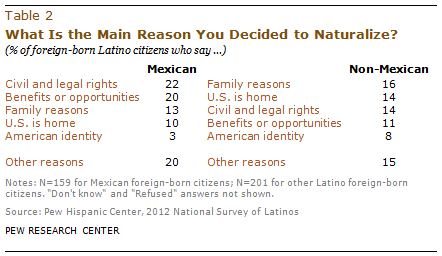 When asked in an open-ended question,8 almost one-in-five (18%) naturalized Latinos gave reasons related to acquiring civil and legal rights as their main reason for obtaining U.S. citizenship. An interest in having access to the benefits and opportunities derived from citizenship is cited by 16% of respondents, and family-related reasons are cited by 15%. Another common reason given by naturalized immigrants relates to viewing the U.S. as home (12%).9 This is followed by the 6% who say the main reason for becoming a U.S. citizen has to do with their sense of identity as an American or their love of the U.S. An additional one-fifth (18%) of foreign-born Latino naturalized citizens cite other reasons for naturalizing. Among the 18% of Latino foreign-born U.S. citizens who identify civil and legal rights as their main reason for naturalizing, about seven in ten (72%) cite gaining the right to vote. Among those naturalized Latinos who say benefits or opportunities are the main reason that they became U.S. citizens, the most common reason given is for “more or better opportunities” (31%), followed by “more or better benefits” (19%) in general. Being able to travel internationally more easily by holding a U.S. passport is the most commonly mentioned benefit (19%), followed by accessing certain jobs (13%). Utilizing specific benefits, such as Medicare and Social Security, is mentioned by 6% of those who cite benefits or opportunities as their reason for naturalizing—1% of the entire sample of naturalized Latinos. Among those who cite family reasons for becoming a U.S. citizen, almost half say they were naturalized as a result of parental choice or desire (7%). These respondents were either naturalized as minors when their parents became citizens or were brought to the U.S. legally as children and decided to become naturalized when they came of age. Having members of the family who are U.S. citizens is another important reason Latinos become naturalized–some 3% cite this as a key reason. Sponsoring a family member to migrate legally to the U.S. is the main motivation of 3% of foreign-born Latino U.S. citizens. In addition, a small share (2%) of naturalized Latinos say they obtained their citizenship for their family or their children, without further specification. Long-term residence reasons are the primary motivation for 12% of foreign-born Latino citizens who have become naturalized. Among them, about three-quarters say they became naturalized because they lived here or they consider the U.S. home now. For the rest, naturalizing was a way of permanently staying in the U.S.
Who Cites Civil and Legal Rights? Latino naturalized citizens who are currently employed, have a higher family income, speak better English, and are under age 50 are more likely than other demographic subgroups to say the main reason they naturalized was to acquire civil and legal rights. Some 22% of those who are currently employed say they naturalized to acquire or protect their rights, compared with 10% of those not currently employed. Similarly, the share citing civil and legal rights as a rationale for seeking naturalization increases as family income rises. More than one-fourth (27%) of naturalized Latinos with higher household incomes—$40,000 a year or more—say their main motivation in obtaining citizenship was civil and legal rights. By contrast, naturalized Latinos with incomes below $40,000 are less likely to say this was their main motivation—20% of those with household incomes between $20,000 and $39,999 and 14% or those with household incomes below $20,000 a year. Among foreign-born naturalized Latinos, those who say they speak English “very well” or “pretty well”10 were more likely to have this motivation (21%) than those who say they speak English “just a little” or “not at all” (13%). 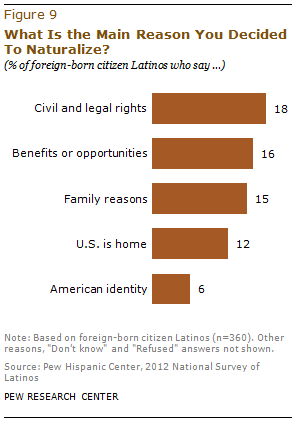 Fully one-fourth (25%) of foreign-born naturalized Latino adults under 50 years of age say “civil and legal rights” is the main reason they decided to become naturalized. This compares to about half of that share of those 50 years or older who identify this as their main reason (13%). Who Cites More Benefits and Opportunities? Foreign-born Latino citizens who are male, have a high school education or less, and who have been in the U.S. for fewer than 20 years are more likely to say the main reason they became naturalized relates to access to benefits and opportunities derived from U.S. citizenship. Almost one-in-five (19%) male naturalized Latinos say they decided to become U.S. citizens for the benefits and opportunities that citizenship brings, compared with 12% of their female counterparts. Naturalized Latinos with a high school diploma or less are more likely than those with some college or more to say the main reason they became U.S. citizens was to obtain certain benefits or opportunities from naturalization—18% versus 12%. Among foreign-born naturalized Latinos, those who are female, not employed, or have been in the U.S. for more than three decades are more likely to say the main motivation to become a U.S. citizen was their family. Almost one-in-five (19%) naturalized Hispanic females say they decided to become U.S. citizens for family reasons, compared with one-in-ten (10%) Hispanic males. About one-fourth (24%) of naturalized Latinos not currently employed say family reasons were the main motivator for becoming naturalized. This compares with 10% of employed naturalized Latinos. Twenty-three percent of naturalized Latinos who have been in the country more than 30 years respond similarly. This percentage is higher than that for those who have been in the country 20 years or less (13%) or 21 to 30 years (9%).